I realized that over the course of the last year or so I've started a number of projects in this blog and haven't really got back to them so I thought I'd give you an update on where things are at. 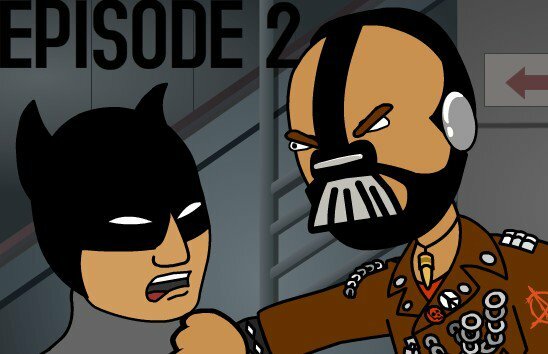 Last year I announced I was working on Bat Storm, Episode 2, with an expected release date of August 2012. Obviously that didn't happen. For various reasons I had to shelve the project. The main one being me becoming some what frustrated with the direction things were going. I think I started to get a little too ambitious and I also didn't like having a script written in advance. I never wrote a script for Episode 1, the story just evolved organically as I animated it. That's what really held my interest and pushed me to finishing it. I wanted to know how it ended. 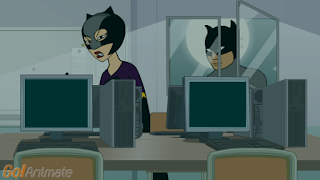 Recently I've released new Bat Storm, Episode 2 images onto my Facebook page because I've started working on it again. At the time of writing I have a full two minutes of part 1 animated. This time around I've scaled back my ambitions to just creating as much as I can using existing GoAnimate content (as I did with Episode 1). I've also been adding new lines to the existing script as I animate, to make it funnier and to return to the organic way the original first episode was made. I'm not going to put a release date on Part 1 of Episode 2 but my enthusiasm is higher than it has been for a long time to work it. 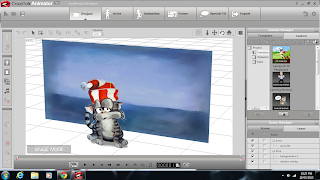 Cool Froyd is my most recent project using Crazy Talk Animator Pro to create all the animation. I had hoped to have completed a first episode of my intended series, featuring the animated version of one of my original painting, by now. Unfortunately I've struggled to come up with a good script for the character despite doing a fairly extensive mind map of possible things Cool Froyd could chat about. I am still mulling over what to do with Cool Froyd and hope to have something soon - even if I have to sit down and just try and improvise something. My Business People were intended to be my first serious Crazy Talk Animator Pro project however at the time I really struggled with learning Crazy Talk and I also needed to learn Serif Draw X5 so I could trace the characters into Flash (.swf) files. Since starting, I did make an attempt to turn the business man into a Flash character with Serif Draw but never managed to finish it to the point where I could start bringing him into Crazy Talk. I also started to animate him using Koolmoves so I could put him in my Animation 4 Business promotional video. Currently Cool Froyd has taken over as my first serious Crazy Talk Animator project but what I'm learning from that has really helped me understand how to move the Business People project forward. My intention is to go back to work on them once I've completed the first episode of Cool Froyd. 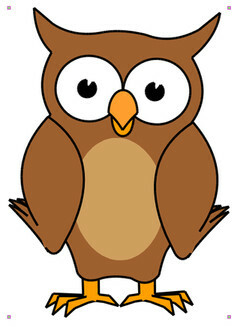 Alvin the Owl is a character I started to animate after his sketch designs were rejected by a client. I felt he was too good to leave as a sketch. So far I've animated about three actions for him in Koolmoves that I did as part of a Koolmoves tutorial video but haven't worked on him in quite a while. I do hope to get back to animating him with at least five to six standard actions by which time I'll release him to the GoAnimate Community. So that's a run down of all the projects I've started/announced in this blog that I hope to complete over the next few months. I'll do my best not to shelve any of them again. I'd seen your BatStorm posts on FB. nice to hear about the others as well. Perhaps for Cool Floyd you could do something about him talking about his owner, perhaps preparing notes with another cat. I once read a pretty funny novel where the cats were the mian charcters in a murder mystery and us humans were refered to as "tin openers." Cool Froyd talking about his owner is a possibility. I'll have to add that into the mind map I did of potential topics for him. Can't believe that didn't cross my mind. Thanks!